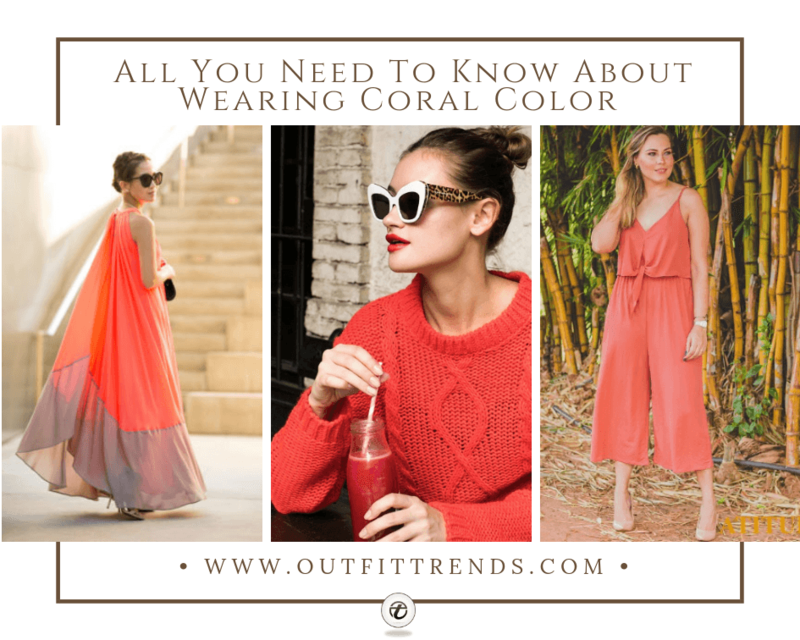 Women Coral outfits: Coral or the living coral- the Pantone color of the year 2019 is all that you need this year! Because what better color would you even pick. Coral has it all; a slight hue of orange, and a tint of pink. It is basically a spectrum between orange and pink. This is exactly the fresh vibrant hue we are all looking for to rock in this year. Carol is the perfect mix of colors for any season or occasion. The best part is that this color compliments every skin tone across the globe. This vibrant yet mellow color embraces us with warmth and nourishment to provide comfort and buoyancy in our continually shifting environment. The coral color is as strident as it is scintillating, at least, it can be when it is worn the right way. You don’t have to worry about the season or the style. We are here with the best ideas about different ways of wearing coral color this year that will surely help you in styling up. Understand the color and know its undertones as well in order to mix and match well. Try to pair coral color with a neutral color for day wear. With Coral, less is more so don’t add a lot of other bright colors when wearing coral. Neutral footwear will be the best choice with coral. Gold & Rose-gold shades of accessories will match any shade of coral. Avoid going for heavy layering with the coral color. Don’t be afraid of using prints in coral. What Colors Look Best With Coral? These bold, bright and eye-catching sweaters are definitely a must have for the chilly days. Just wear them with your jeans or black pants, put on your coral lipstick and you’re good to go. If you feel like dressing them up, you can easily layer them over sheer tights and a sparkly dress as seen here. Wearing coral color this year definitely is a great idea. You can wear a coral color dress with slight layering because heavy layering might not be a good idea with this color because it itself is very vibrant. You can wear light-colored shrugs or sweaters over your coral color dress which makes this color absolutely perfect for the Fall season. You can wear sandals with such outfits, use some light accessories and just enjoy your day. Here are 27 Ways to Layer Your Clothes like Pro. Why not add some striped style to this beautiful color. A striped coral dress will give your outfit a monochromatic look and it can be a great idea for the office look. You can pair up your coral striped dress with some bright accessories for some fresh vibes. Try going old school and wear your coral dress with a vintage scarf. Golden footwear and golden accessories will be a great idea to rock in this look. Coral crochet dress! What a great idea to roam around in the summer season. You can wear coral crochet dress with a hat and some nice sandals, neutral color sandals are recommended and once again, a touch of gold won’t disappoint you. This will help you create a perfect look for summer season especially if you are planning to visit the beach and relax. Don’t forget to grab a hat and sunscreen! If you are worried about how to style up this spring season than coral color in some prints won’t disappoint you at all. You can use some floral prints or any other print of your choice and twirl in your beautiful dress. You can wear sandals or sneakers with your outfit in order to complete your look. You will definitely bloom in printed coral just like a flower! Here are 22 Cute Floral Print Outfits Combinations for Spring Season. How about adding some embroidery to your coral dress? This will surely be a bright idea. You can have coral outfits with slight embroidery over them and you will be able to wear that dress on formal as well as casual occasions. So what are you waiting for? Hurry up and grab your coral outfit with some embroidery. Always so poppy! Party time! Just dress up in a coral color outfit for Easter or any other occasion. This outfit will give you a fresh look and you’ll stand out in any crowd. You can wear a skin or neutral colored high heels or stilettos with them. And wearing accessories are definitely must! Keep your accessories simple like some small ear cuffs or simple but classy hoop earrings. Here is your chance to look all stunning on Easter or any other occasion. So, better not waste your time and grab this outfit. Wearing ethnic never goes out of fashion. The best thing to wear on festivals is a traditional outfit. And Pakistani Fashion blogger hirableeh is giving us some major style goals, looking all dope in a coral Kashmiri outfit. You can wear this type of dress with matching heels or you can match your footwear with cutwork present in your dress. Do you want to create something different? Casual yet trendy? Just pick up coral color top and pair it up with printed pants. You can wear printed bell bottoms, jeans, or wide leg pants since they’re all trending these days. This will be a good choice for you regardless of your skin tone or age. You can rock in this outfit if you are in your teens or even in your fifties. Wear this dress with some heels or loafers. Isn’t this just the perfect idea! Denim! Everyone’s favorite since forever until forever. If you have to choose just one look out of all the ones we discuss today, we suggest that you should go for this one! That’s because you can wear a denim jacket over a coral mini dress and look stunning on any occasion. And if you are planning on going casual just wear a coral color top or sweater over denim jeans and pair them up with loafers or strappy heels. You can create various looks by using different denim pieces by just mixing and matching them with your coral dresses. Here are 20 Ideas How to Wear Denim Jackets. How about wearing Pantone color of the year from head to toe? Such a fantastic idea! Be it your wedding, prom, welcome party, farewell dinner or any other casual or formal occasion, coral will always give you the most regal look. It can also be a great choice for a bridesmaid dress and of course we love the choice of beachy waves to go with this dress. Hey ladies! This is something new and totally different. If you are looking for something formal and super chic you can try wearing a suit. A high waist suit is usually recommended. You can wear the entire suit in the same color or add a more neutral color like wearing this jacket with black pants. Another idea is to wear black or bold color inner with your top. And if you are planning on trying something chic then you can wear printed and floral inners. You just need to pick the right pair of footwear with this super chic dress and of course how can we forget glamorous accessories. There you are, all styled chic and dope. Neutrals are the building blocks of any essential wardrobe so why not to add a neutral color to you coral color outfit? You can wear a neutral color blazer with your coral color outfit. It will add some layering to it moreover it will mollify the intensity of scintillating coral color. Don’t forget to add on some eye catching accessories to enhance your look. Who doesn’t love street style? Carol color can be a super cool idea for street style. You can wear a coral skirt with a t-shirt or sweatshirt along with an oversized coat. You can wear heels with your outfit for a classy look. After all, it is a street style so a hair bun will surely compliment your attire. Flowy dresses are every girl’s favorite. You can wear them in spring and summer. Coral Flowy dresses, flowing with the wind. Such a relaxing feel and with frills you can always make a lasting style statement. Fashion blogger Marie Jasmine is looking stunning in her Coral Sunday outfit. You can try out chiffon halter dress in carol color. An outfit like this would be perfect for a romantic date night. For footwear you can pair them up with neutral color shoes, we prefer heels if its a formal dinner date. Do have a look at these 18 Ways to Wear Halter Outfits Everyday. All vibrant coral! To try something different, you can always play with caps and hats to enhance the look of your outfit. Wear neutral or bold color caps and hats of different designs with your coral color outfit. For winter season you can add some black tights and a black blazer or neutral colors and in summer you can enjoy just the off shoulder top with neutral footwear and some accessories. You can ace any outfit any time, it’s all about mixing and matching and creating a whole new outfit. Polka dots are in fashion from as long as we can remember. So, why not add polka dots to coral color and wear that outfit with some bold color shoes? We recommend this style a hundred percent! This can be a perfect outfit for your date night or a movie night. Moreover, you should try wearing coral with polka dot print in the summer and spring season. All fresh and chic. White color! The most important color in the wardrobe. You can wear this color with any other color and it will not fail to impress. You can wear a white pant or skirt with a coral color top or vice versa. Moreover, you can wear white shoes as well. White accessories with coral color clothes won’t be a bad option as well. There are unlimited ways in which you can mix and match coral and white color. No other color conveys as many contradictions as the color black, and that’s probably why it’s arguably the most loved color in fashion. What do you think of wearing a coral color with black? This can be the perfect match for any season. You can wear back jumpsuit, gown or just trouser and shirt as inner and add coral touch to it by wearing a coral color coat or blazer. Here are 23 Ideas on How to wear Black Denim Pants. If winter season is around the corner and you want to stay warm and cozy and make no compromise on your style then you can go on with coral color blazers and jackets. Think of this as a one-time investment that you can keep enjoying for many years (unless your size changes drastically). They say the first thing people tend to note about you is your footwear. So, why be a disappointment in the very first look? You can wear coral color footwear with your outfit. This is a fabulous color for footwear and it goes with almost everything. We know that girls love color coordination and matching their clothes with shoes so, you can even wear a coral color shirt or sweater and match your footwear with it. We all love theme parties! Who doesn’t, right? And we understand how hard it is to choose a theme for the party. Even a theme for a bridal shower or a birthday party. This year, we recommend you to chose a coral color as your theme! Wear the same coral color outfit with high heels and hats. Wait wait… Don’t forget to add on some pearly accessories, after all, it’s a party! Coral is undoubtedly the best & most cheerful color that you would want to brighten up a dull day. We hope you found the article beneficial. How are you planning on adding coral to your wardrobe this year?